With the recent news of the wildfires that have taken place in Southern California, we are saddened by the destruction caused by the fires that have affected many families and homes in California. 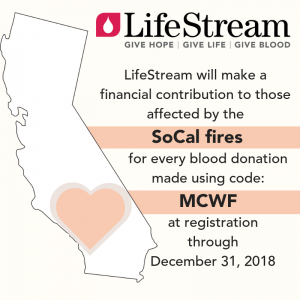 To help, LifeStream will make a financial contribution to those affected by the wildfires for every blood donation made today through December 31, 2018. Please use code “MCWF” at registration at any donor center or mobile drive. Make your appointment today by calling 800-879-4484 or clicking here: Make an Appointment. Did you know?With ExpressPass you can speed up your donation process by completing the required pre-donation reading and health history questions before arriving at the donation site.